Gameplay The gameplay consists of two main mechanics: Parrying in rythm with music, and traditional platforming. 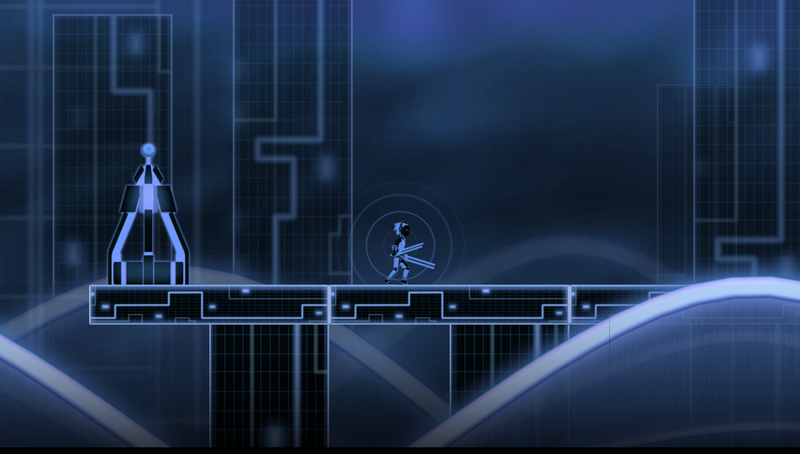 The character moves freely just like in Mario, Metroid and every 2D platformer ever made. Klang's twist however, reveals itself as these two elements are combined, forcing the player to multitask between avoiding deadly obstacles while simultaneously fending off attackers, both in rhythm to the music. Setting Klang is a revenge story about Klang, the "prince of sound", who is just returning to his kingdom as the new heir to the throne. He gets betrayed by his father, defeated by his minions, and cast off into the abyss. This is all the motivation Klang needs to climb back up from the musical underworld, and reclaim what's rightfully his. I forgot to mention to play that one with the volume turned to 11! The TRON style aesthetics where enough to sell me this, but with such an intense trance soundtrack and fascinating gameplay, I think this could turn out to be quite special! Will be keeping an eye out for this in the future. On a more personal note, I wish nothing but good things for -bLiNd- in the future because he did what most of us wish to do but end up never doing: He quit his day job to become a full time professional musician. *Update* I've had a chat with the game producer and while there is yet no official website site, you can follow progress of this game over Facebook.